The maker movement has inspired many librarians to make sure that not only the informational needs of our students are met, but their creative needs are as well. I'm often asked why we are making this switch; why we are expanding our offerings, why we are dabbling in things like 3D printing and electronics that are usually the domain of shop teachers. I was raised by two makers, who not only inspired me to love reading, but taught me there was no project we couldn’t figure out together. My father is a mechanical engineer and woodworker, and my mother is a seamstress and stained glass artisan. Can you imagine a better combination for nurturing a young learner? I grew up in a house where I didn't have a store bought dress until I was in high school, and I did my homework at a desk my dad built. My fondest childhood memories are of projects that we worked on as a team--everything from Halloween costumes to science fair projects. Making wasn't something just for shop class. It was something for everyday life. My library's makerspace started with a mess. The first thing students were greeted with as they came in our front library door was a glassed-in office. It was supposed to be my office, but I rarely spent any time there. So it became a catch-all, a forgotten corner that I would dump things in on my way to help a student or teacher. 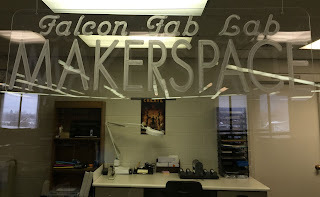 In the spring of 2014 I was complaining to my assistant that I would love to start a makerspace, but our mid-1980s vintage library just didn't have room for it. My eyes came to rest on the piles of papers I could see through the window, in the neglected office I never used. "I just found the space for our makerspace," I told her. We immediately went to work, clearing out the clutter and most importantly, freeing anything that students could use from our back storage room. Paper cutters, labelers, stencils. Lamination machines and craft supplies. We were surprised by how much we already had. Then came the research. I read everything I could get my hands on, from Make: Magazine to Laura Fleming's Worlds of Making. I found the best professional learning community I could ask for on Twitter, and scoured it daily for ideas and suggestions for makerspaces in libraries. And most importantly, I asked our students what they wanted. makerspace than a sign you figured out how to make yourself? Sure, I got a few pie in the sky suggestions like laser cutters and robotics. But I was surprised by the overwhelming number of simple requests. Cardboard. Glue sticks. Watercolors. In a school with one of the most diverse socioeconomic backgrounds in our district, these students were hungry to create with whatever we could provide. 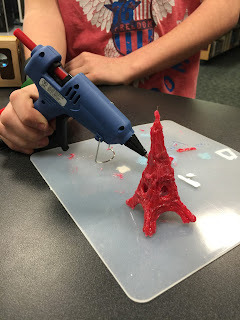 Starting a makerspace is not an immediate process. After clearing the idea with my administration, we started small, gradually building our collection of tools and materials using library fines for funding (lest anyone claim we were taking away money "from the books.") And speaking of books, we spruced up our collection with how-to manuals on everything from blogging to crochet to robotics. Each week we'd strive to introduce something new during our school's enrichment/remediation time, and give the students time to create. The Eiffel Tower...made out of hot glue! Why does your library need a makerspace? Because you'll ask your students to build something that represents community to them. And you'll cry when the students leave and you look at their touching creations--things like nests full of baby birds and mobiles of stars proclaiming they are all different, but part of the same galaxy. Because after a particularly challenging mission, the captain of your space flight simulator crew will tell you he wants to work on his patience, because he wants to be the best possible captain and not disappoint his crew. Because a student who only reads silently during lunch will wander over and interact with his classmates as they take apart a broken laser printer to see how it works. 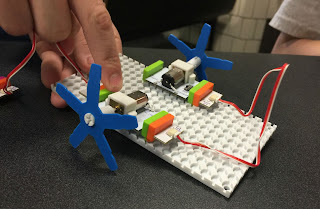 Because you will be working with a student on a project and she will turn to you and say thank you, admitting that without the makerspace she wouldn't be able to pursue her hobby because her family can't afford the tools she needs. And the next time she comes in you'll have a discussion about a college program you think she might enjoy--right now she's struggling with seeing a point to school at all. That maker mindset I got from my parents has made all of the difference in my life, and I want to provide that same opportunity to my students. I never want them to think, "I'd love to learn how to do that, but..." There should be no excuses on the road to exploration--and I firmly believe that road should begin in the library. Ready to start your own library makerspace? Click on the "Libraries & Makerspaces" link on the top menu for resources to help you start on your own making journey!